Big additions continue to come to Universal Orlando Resort. Along with two new hotels opened since 2014, Universal Orlando is again expanding its stable of on-site hotels offering yet another value-priced placed to stay at the theme park resort. Slated to open in August 2018, Universal's Aventura Hotel will have an ultra-mod vibe, featuring a 16-story all-glass tower, contemporary decor, and an open-plan, loft-inspired lobby with 18-foot windows. 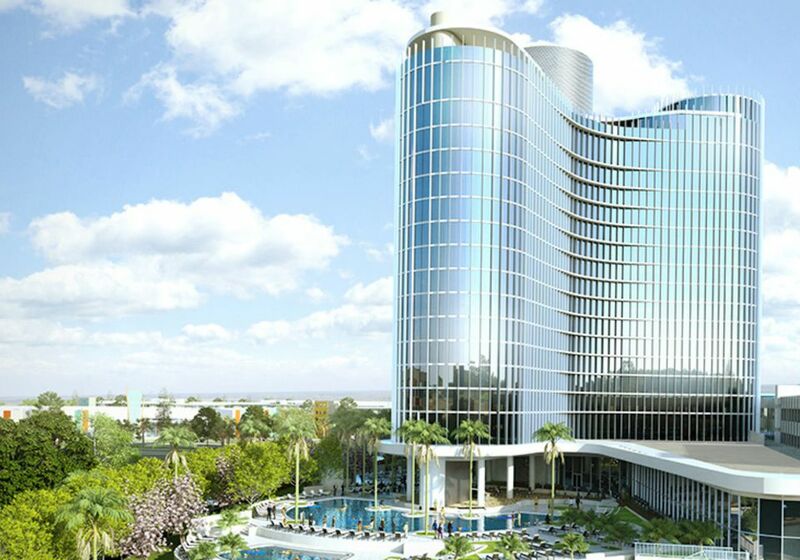 The 600-room hotel will be categorized as one of Universal's "prime value" hotels, which puts it in the same price range as Loews Cabana Bay Beach Resort. There are three room levels, including 314-square-foot standard rooms and 385-square-foot deluxe rooms, both of which include floor-to-ceiling windows, separate bath and vanity areas, and the option to upgrade to a "skyline view" for sweeping views from the highest floors of the sleek tower. The third room level is the 591-square-foot kids suite, which sleeps 6 and features one room with a king bed and sofa bed and a separate area for children that includes two twin beds. Universal's Aventura Hotel will have a terrific location adjacent to Loew's Sapphire Falls Resort and near Universal Orlando's three theme parks, Universal Studios Florida, Islands of Adventure, and Volcano Bay. Guests will be able to get to and from all three parks and Universal CityWalk, the dining and shopping district, via walking paths or complimentary shuttle service right from the hotel. Some of the highlights of Universal's Aventura Hotel will be the rooftop bar, which will offer incredible panoramic views over all three of Universal Orlando's parks. Guests will be eye level with the peak of nearby Krakatau, the 200-foot-tall centerpiece of Universal’s Volcano Bay water park. The hotel will feature a crystal clear pool and poolside hot tub, with a splash pad for little kids. There will also be plenty of dining choices, including a lobby-level casual food hall with five eateries. Need more reasons to choose Universal's Aventura Hotel? Staying at one of the on-site hotels at Universal Orlando Resort brings a lot of benefits that can save you both time and money. Convenient location: All of the properties are within walking distance of the theme parks and Universal CityWalk and they all offer free bus shuttle service. In addition, three of the properties are served by a free water taxi. Early park admission: Guests at Universal properties are given entrance to The Wizarding World of Harry Potter and Universal’s Volcano Bay one hour before the theme park opens (valid theme park admission required). Free entertainment: All Universal Orlando properties offer an array of daily fun family activities such as night-time "dive-in movies" by the pool. Some properties feature character meals. Charging privileges: Guests have resort-wide charging privileges with their room keys, so all purchases and dining bills throughout Universal Orlando Resort can be charged back to your room. Purchase delivery: Planning on souvenir shopping? Any gift-shop purchases you make in the theme parks or at Universal CityWalk can be sent back to your hotel for free, so you never have to carry extra bags around with you. Free Wi-Fi: All Universal Orlando Resort properties offer complimentary, hotel-wide Wi-Fi. There is also free wi-fi in all the theme parks. All of the Universal Orlando hotels boast swimming pools and some combination of fun attractions that include water slides, lazy rivers, and splash pads. While visiting the theme parks, there are also lots of ways to keep cool in the Orlando heat, from wet rides and splash pads to water-play attractions and ice cream parlors.